Although thought to be less harmful, smoking hookah can do just as much damage to your dental health as smoking does. Dating back to the Safavid dynasty, hookah smoking has been a staple in Middle Eastern culture for over 500 years. In recent decades, hookah smoking has become more popular in the US, particularly among young adults. Flavored tobacco, hookah lounges and the belief that smoking out of the traditional Mediterranean water pipe is less damaging when compared to cigarettes or cigars all contribute to the rise in popularity. The science, however, contradicts the third conviction. 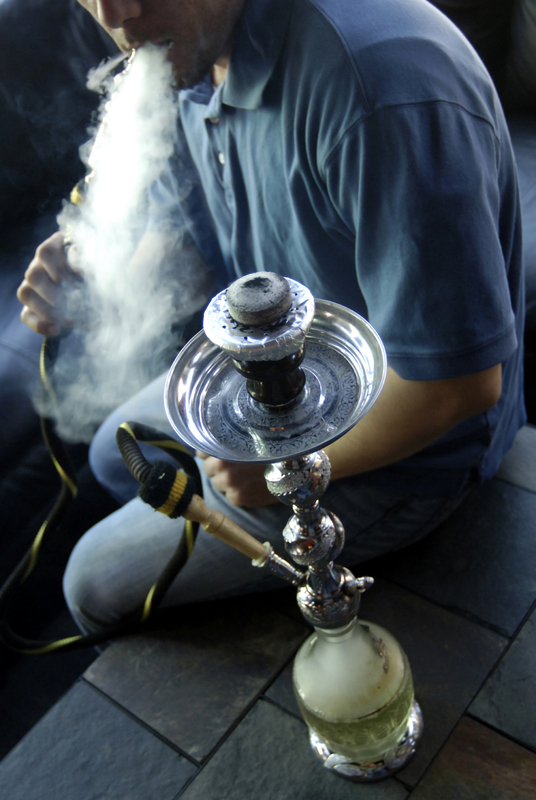 Research suggests that hookah smokers are at 5 times greater risk of periodontal disease as compared to non-smokers. That’s an even greater risk than cigarette smokers, who have a 3.8 times higher chance of developing periodontal disease! Bad Breath: Smoking of any kind causes bad breath, and smoking through a hookah involves inhaling even larger amounts of smoke. Don’t let the sweet smell of flavored tobacco mislead you. Halitosis is indeed an embarrassing side effect and hookah smokers are even more prone to suffer from it. Oral Cancer: A more life-threatening effect of smoking hookah is that smoking from a water pipe does little to protect your mouth from this potentially fatal disease. The Oral Cancer Foundation estimates that 42,000 Americans will be diagnosed with oral or pharyngeal cancer each year. Historically, at least 75% of those diagnosed at 50 and older have been tobacco users. Dry mouth: Smoking a hookah causes a decrease in the production of saliva, which plays the role of a natural oral cleanser. A dry mouth also makes your mouth more susceptible to cavities. The leisurely activity of smoking the sweet-smelling hookah is not as safe as it seems. Do your oral health a favor by kicking the habit for good! If you want to quit smoking and need a method of doing so, it might be worth taking a look at different vaping kits with refillable pods, nicorette patches or just dropping it all in one go. Whatever you choose to do, it’s definitely worth quitting! There are many health risks of hookah such as bad breath, oral cancer, dry mouth etc as given in the article. Hence hookah should be consumed by first thinking of all its consequences.